The match opened at a brisk pace and developed into an end-to-end exhibition of quality football. Garefrekes latched on to a deflection off Hooper for Germany's first chance, but All-Stars keeper Jönsson of Sweden beat away the 4th minute effort. Up the other end, Boxx saw her header fly narrowly wide just a minute later. The next opening fell to Germany's Prinz after good work from Wiegmann, but Jönsson again proved equal to the task. 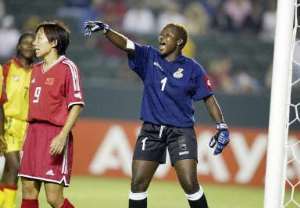 It was to be the keeper's last contribution as she was forced out injured after 12 minutes following a collision with Prinz, Ghana's Sulemana taking her place. Sweden's Svensson then laid on a shooting opportunity for Boxx from 20 metres but Germany custodian Rottenberg held the shot with 13 minutes played. Sweden's Moström ran on to Wambach's precise through-ball to fire the All Stars in front from 16 metres on the quarter hour, but the world champions refused to buckle and Odebrecht fired narrowly wide three minutes later before Prinz saw her 19th minute header hacked off the line by Mugneret-Béghé. But the action switched to the other end and just two minutes later the Boxx's potent volley shaved the post. Germany were rewarded for their efforts on 27 minutes as 2003 FIFA World Player of the Year Prinz drove home right-footed from eight metres following excellent build-up play by former captain Wiegmann. Garefrekes then broke down the right but Meinert's first time shot from five metres whistled wide. The frenzied pace died down for a short time before the end-to-end action resumed shortly before the break, Germany easing into a half-time lead as Garefrekes made the most of Meinert's precise delivery to give Sulemana no chance. "I'm a little surprised at how well both teams are playing, I'm sure there's plenty more to look forward to," said at half-time the injured Nia Künzer, scorer of the Golden Goal to seal the Women's World Cup trophy in Germany's 2-1 victory over Sweden. The expert commentary was spot on: Germany emerged from the dressing room in determined mood and Prinz missed a great opportunity from close range following good work from Fuss a minute after the restart. But the All Stars responded well and Svensson levelled on 48 minutes with a glorious curler from 12 metres following substitute Pichon's gritty build-up work. Seven minutes later Prinz came close again although from a suspiciously offside position. The lively Svensson then teed up Marta but the Brazil star was dispossessed by Stegemann's heavy challenge, referee Petignat choosing to wave play on. However, the FIFA Women All Stars now held the upper hand and Pichon provided the assist for Akide to put the world XI 3-2 up after 71 minutes. Marta then drove wide from a free-kick and Pichon might have settled matters only for substitute keeper Angerer to pull off a fine save. Germany were not dead and buried yet as Fuss and Garefrekes both saw efforts denied by Sulemana on 82 minutes. Meinert drove goalwards but with no power three minutes from time, before Prinz collected the only booking of the match 60 seconds later. Germany poured forward in search of a last-gasp equaliser, but the All Stars comfortably ran down time and came away with a deserved victory under their belts. However, after a worthy and attractive match, no-one would dispute the real winner was women's football.